Exeter Chiefs went above Saracens into the Premiership play-off places as Thomas Waldrom's late try secured a magnificent win at Allianz Park. 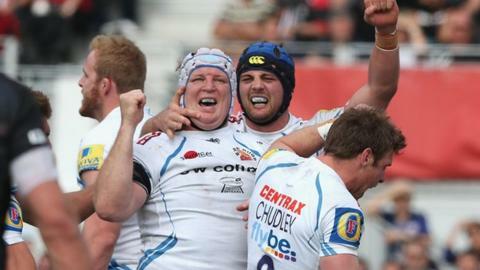 Sarries twice led through Chris Ashton and Chris Wyles, but the Chiefs replied through Luke Cowan-Dickie and Waldrom. Owen Farrell put Saracens 20-17 ahead with a penalty, but Waldrom's second try gave Exeter four crucial points. They will go into next weekend's home game against Sale in fourth place, one point behind Leicester in third and ahead of Saracens on points difference. A bonus-point victory over Sale next week should guarantee Exeter's place in the play-offs but Sarries, who had the consolation of a losing bonus point, could pip the Chiefs if they win with maximum points against already relegated London Welsh and Exeter only manage four points against Sale. However, both clubs would finish in the top four if they win and Leicester lose at home to leaders Northampton. The Chiefs went in front early when Gareth Steenson, after dragging a drop goal attempt wide, kicked over a penalty following an offence on the ground by Saracens, for whom George Kruis was making his 100th Premiership appearance. But the home side soon demonstrated their attacking strength as powerful surges by Mako Vunipola and Jamie George pressed Exeter back and Ashton sprinted in from distance, with Charlie Hodgson adding the conversion. The visitors retaliated four minutes later when Cowan-Dickie picked up and drove over, with Steenson adding the extras, but they were soon behind again as David Strettle played in Wyles, who went in at the corner from 30 metres and the try was confirmed after the referee consulted the TMO to see if the pass had gone forward. A line-out led to a burst forward by Cowan-Dickie, which allowed Waldrom to cross, and Steenson was again on target with the conversion, but Hodgson's penalty made it 17-17 at half-time. Saracens sent on Farrell as a replacement for Hodgson after the break and he kicked over the penalty which put Sarries in front again. Exeter head coach Rob Baxter changed the entire Chiefs front row and after Chiefs' Damian Welch won a lineout, Waldrom found just enough space to score with 10 minutes remaining on the clock. Steenson extended their advantage to four points and superb tackling by their back-line denied Strettle and Ashton in the closing moments as Exeter held on for the win. "I'm hugely disappointed. It was not good enough to let them score three tries in the manner in which they did. "We didn't take some big chances, didn't show enough composure and we missed the muscle of Billy Vunipola. "We don't know how motivated Sale will be for their visit to Exeter for when they went out of Europe, they lost their next game by over 50 points. "We just have to get five points from our game and score as many points as we can." "Next week will be biggest game of rugby Exeter will have been involved in. We have to be mentally tough, not crumble and stand strong on our own patch. "I'm very pleased for the players to come through this in the way we did as we've not been at our best in recent matches. "We've been in tight games against Saracens before, but they normally nick it, so it was nice to come out on the right side." Saracens: Goode, Ashton, Bosch, Wyles, Strettle, Hodgson, Wigglesworth (capt); M Vunipola, George, Du Plessis, Kruis, Itoje, Brown, Burger, Wray. Replacements: Tompkins for Bosch (53), Farrell for Hodgson (50), de Kock for Wigglesworth (72), Brits for George (48), Johnston for Du Plessis (48), Joubert for Itoje (75), Hargreaves for Brown (54). Exeter: McGuigan, Whitten, Slade, Hill, Jess, Steenson, Chudley; Moon, Cowan-Dickie, Francis, Mumm (capt), Lees, Ewers, White, Waldrom. Replacements: Rimmer for Moon (54), Yeandle for Cowan-Dickie (54), Brown for Francis (54), Welch for Lees (57), Horstmann for White (57). Not Used: Lewis, Vainikolo, Bodilly.